OK as I promised I would post my weekly bargain finds. This weeks Fashion Bargain Find was purchased during my Vegas trip. Hmm seems like a lot of my bargain finds are from Vegas trips. That is one reason I go to Vegas a few times a year. I love the outlets in Vegas, they have 3 great locations where I spend hours finding great things. My favorite store that I must go to all 3 outlet locations is Coach. This trip I didn't purchase a purse or wallet, I snatched up some jewelry. I believe its been about 1 year or a little more since Coach introduced jewelry to their collection. In March I was at the regular retail Coach store and saw a lot of really cute and nice silver jewelry. I commented to my boyfriend that some silver Coach earrings would be a very nice birthday gift. Well my birthday came in May and no earrings. Later in May I took a trip to Vegas again....guess what I saw in the Coach store. Silver peace sign earrings. The same earrings I had seen 2 months previous at the retail store. 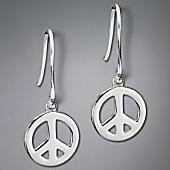 The silver peace sign earrings retail for $98. Coach outlet store had them for $69 - 40% off. Being that I was at the outlet store on Memorial day, they were having an extra %10 off. 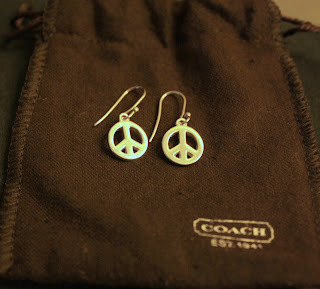 So to make this long story short, I ended up paying $25 for a pair of silver peace sign Coach earrings. This Fashion Bargain Find just shows you that outlet stores don't just carry old stock and past season items. I researched the Coach website and found that the earrings are still selling on the website. So next time you take a trip to Vegas don't forget to stop at the outlets and see what great Fashion Bargains you can find! Hey lady! I like it over here :-). I used to be so into gold, but now I prefer sterling silver. Our Coach outlet didn't have these but I'll keep an eye out. Have a great holiday!